Your garage door panels can be made of a variety of materials, each with its own benefits and disadvantages. Three types of materials have become quite common, though, and we wanted to take the time to help you learn more about each one. There's something about wood; maybe it's the homey vibe that represents craftsmanship of nature; maybe it's the serene quality that associates the smoothed varnished look with an idea of honest simplicity; or maybe it's just pretty to look at… whatever the reason, we can all agree that wooden doors have their appeal, and if your garage door panels will be made of this material, your home is bound to "pop" from amongst the lackluster counterparts your neighbors are boasting. However, wood being what it is – a porous and fibrous organic material – its longevity is sure to be tested. 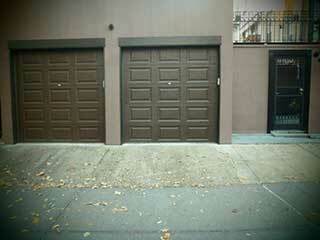 Wooden garage door panels require extra maintenance work, such as regular repainting, in order to be sustainable. They are less resistant to the elements, and are far more susceptible to wear and tear damages. As any Cimmerian barbarian undoubtedly knows, steel is a precious gift. It's highly durable, extremely strong, and effortlessly reliable. If your home is your "castle", than a garage door that's as sturdy and secure as an armor-plated horse is definitely what you'll want to go for. It isn't without its flaws, however, and while it doesn't require as much maintenance as wood does, it will require some minimal care. Rust is a plague to this type of material, and while certain types of special coating can allow your door panels to resist this nuisance, you'll have to actively make sure your door hasn't succumbed to its clutches. Similar to wood, steel is also quite heavy, and will require a powerful opener to be lifted and lowered safely. Door panels that are made of this type of material will require very little maintenance, as they won't rust, and won't suffer from changes in outdoor climate. They'll also be very light, and won't require as much horsepower in order to be operated. However, they are far from sturdy, and will easily bend and damage by impacts. That means their longevity won't be all. Our company is a trusted local service provider that repairs and installs automatic garage door systems. Our technicians undergo routine training courses and evaluations to make sure they are fully capable of delivering nothing but excellence. If you want a new door or opener, or need a broken part repaired, we're the team to call. Feel free to browse our website for more information. Thank you for choosing Garage Door Repair Deerfield! One of our experts will be in touch soon. Feel free to browse our website for FAQ, tips and more useful information in the meantime!